Doug DeVilbiss, Washington C.H. and Wilmington Donatos Pizza owner, and Chelsie Hornsby, Fayette County Memorial Hospital director of business development. 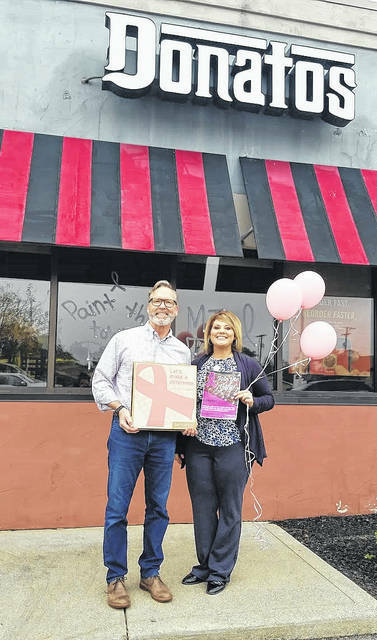 Donatos Pizza, 1211 Columbus Ave. in Washington C.H., is partnering with the Fayette County Memorial Hospital Foundation to raise funds to support their efforts to assist those with breast cancer in Fayette County. Donatos is bringing back their pink box campaign until Oct. 31. Donatos will donate 50 cents for every large pizza sold at regular price through the month of October to benefit the FCMH Foundation. Call Donatos at 335-8000 or order online at donatos.com. https://www.recordherald.com/wp-content/uploads/sites/27/2017/10/web1_Donatos-Pink-Box-2017.jpgDoug DeVilbiss, Washington C.H. and Wilmington Donatos Pizza owner, and Chelsie Hornsby, Fayette County Memorial Hospital director of business development.